In an age where new energy sources, electric vehicles and computer innovation have become the hot ticket in the tech world, many schools nationwide have been embracing sustainable energy supplies. 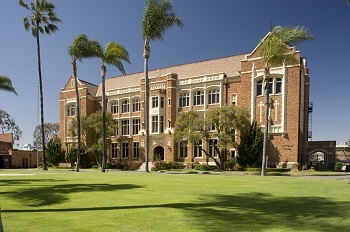 As a high school that is deeply rooted in the environment of Southern California, Loyola should lead by example in the adoption of new energy sources. From a logistical standpoint, Loyola is positioned at an extremely favorable latitude and longitude, providing ample sunshine and arid weather conditions that are ideal for solar power installations. Encouraged by a number of municipal solar policies, rebates and the increased usage of electric vehicles, California is ranked first in the nation for solar energy production with an estimated solar power capacity in the State to supply approximately 3,494,000 homes with electricity. Solar power also provides a great way to diversify our power sources to add some resiliency. Given the geographic multitude of fault lines in the California area, it’s inevitable that Los Angeles will face a large seismic event, an activity with high likelihood of knocking Loyola off the grid for an extended period of time following an earthquake. Solar power would provide Loyola with a viable backup system, especially if it was coupled with an energy storage system like Tesla’s new Powerwall battery, a zero net energy system that uses as much energy as it produces. A system like this would avoid the significant fumes and air pollution that are emitted by conventional diesel generator backup systems. 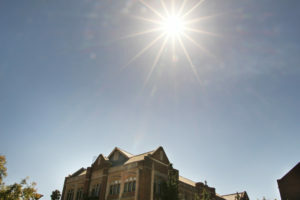 An argument against the introduction of solar energy could be the negative aesthetic impact of solar panels on the roof of the beautiful historic structures of the Loyola campus. However, many institutions have solved this problem by installing panels on the roof of adjacent carports. This could be a great way to capitalize on available space in our surface parking lots while simultaneously creating shaded parking spots. Finally, the cost of the project must be considered. While we do not have the detailed information necessary to complete a cost/benefit analysis, the SEIA has estimated that “99.6% of all schools in California would save money from going solar.” There are also a number of grants and rebates available for solar installations, and I believe that a Solar Energy Capital Campaign would receive significant support from alumni and other support groups. The Loyola Administration should consider creating a pilot program to install solar energy power on the Loyola campus as it would be a significant demonstration of both our core values and vision.